I have found the love of my life! After all this time begin told in so many ways that the love of my life was something external, I realized the other day that by living a life in line with what I love I am able to actually love my own life. I haven’t felt like this about my life, well to be honest I don’t remember ever feeling that I loved life especially my life and that I do it makes so much sense why it was so painful to not feel this way – this is bliss! Helping people has always been something that I did and I am no different now but it has a very different spin to it. Today as I shared Thriller, Beat It and other dance moves with the kids at “Centre Preshyterien D’amour Des Jeunes” Orphanage I realized that I had been trying too hard to make this Thriller Event about raising money. This was another way that I was not honoring who I really am, by this I mean that I had to create something that seemed more important than what I know to be true in order to make it worthy of acknowledging. I believe fully that human connection and dance can change the world, so the simple act of teaching the choreography to the people here alone is enough for me. What I have been doing though is discounting that belief by then trying to make the impact obvious to everyone. It is hard to really understand or see the impact that dancing with these kids has on all of us and so I somehow felt the need to make it easier for others to see or feel it by attaching it to something external like money. This does not mean that I am not going to try to raise money but it means I am going to shift the energy that I was putting towards that part of the project and use it for other things that are more relevant to the bigger picture. I have a tendency think very big, which can make my vision almost impossible to attain at times and often leads me to feel stuck, overwhelmed and then give up. As I watched that feeling creep up on me this week I realized it was time to make the shift back to my heart and refocus my energy. “Patty Perfection” showed up again! I met a young woman from New York at Ivuka a few days ago and today at lunch as we talked she helped me see that the energy that I was putting into making this event about raising money was actually taking away from the heart of it. I came here to dance, spread joy and love with a group of people from California and I chose to stay and continue to do the same and to continue to heal. I came here with not much money with no intention of looking for a job and allowing my heart to guide me to where I needed to be. I believe that has happened and I have found so much healing along the way. I am now going to take my energy back and give it to myself and the other things that want to do while I am here, like my art project, modern dance, teaching Yoga, hooping, experiencing Rwanda, swimming, eating well, my new friends and writing. These are the things that make me feel good and give me energy to do the work I am doing with the kids and creates balance in my life. Again lack of self-worth showing up in a new way and I am getting really good at catching it before it takes me too far down the old path. 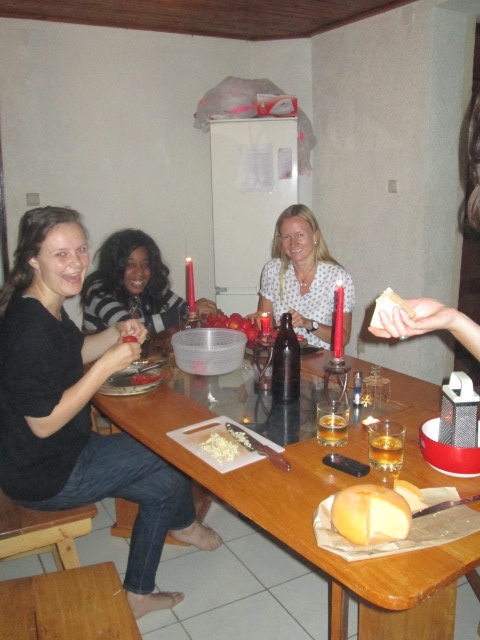 Last night I attended a dinner party at the house I lived at in Remera and will be returning to in a few weeks, which was fabulous. 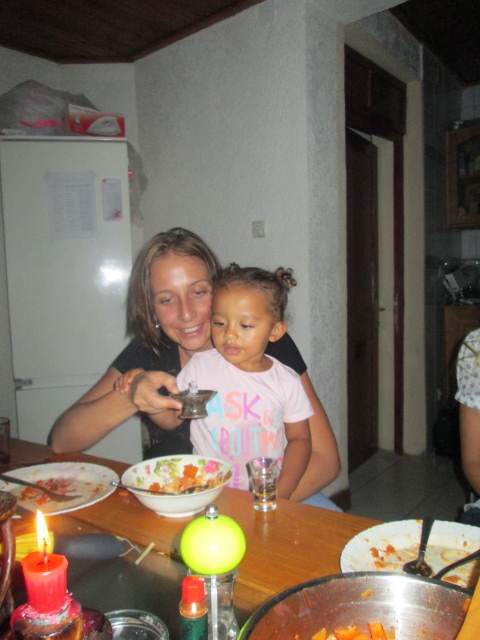 It was beautiful to be with new friends, drinking wine, talking about their lives and sharing good food. 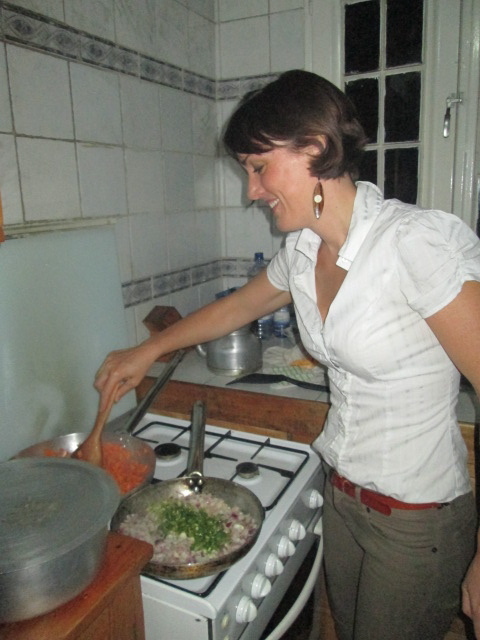 Cooking together as a community and gathering as a group of independent and strong woman was very inspiring. I need to be around these woman, they offer energy that I have had very little experience with and I am so drawn to it. I have more and more woman friends now in my life and I am slowing starting to allow myself to fully be part of the dynamics of which I once was very intimidated by. Now that I have found my inner strength and self-love I feel like I am allowing in female energy in a new and its impact is powerful. Speaking of female energy, Alice, Justins wife is 6 days overdue for the delivery of her baby and we are all waiting patiently for the arrival of a new baby girl. This will be a new experience for me in Rwanda as well and I have already learned quite a bit about the cultural norms around pregnancy and after the birth that I will wait to share when I blog about baby’s arrival! In keeping with taking time for myself the other day I went to Mamba Club, which is owned by a Canadian and has everything from a bowling alley, a swimming pool, yoga, a salon, a restaurant and more. I went there to spend the day being “pampered” which meant getting many parts of my body waxed (9 months since I touched any type of hair removal device! ), a pedicure and a manicure. I love going to the Spa, always have and it is something that I have not really given myself for 3 or 4 years and now feels like the perfect time to reintroduce self-care in a new way. This goes along with self-worth and the added new element of rebuilding my outward expression of Self in a new and authentic way in a foreign country. I left feeling soft, colorful and fabulous which really had an effect on how I carried myself. I noticed my chest was lifted as I walked, my smile was bigger and more authentic, and I felt confidence radiating from me. In my study of Yoga, I have learned that I personally used clothing, hair, accessories as a mask, not fully but in many ways it was about trying to get people to think I was a certain way. It was a way to distract others and myself from the pain, hurt and sadness that I felt inside. I learned this by stripping away all of the things that I used as a mask which allowed me to face the things I was hiding from. Now that I have dealt with the issues that I was hiding from I feel like I can reintroduce parts of myself in a new way. As I said, not all of the outward expression was inauthentic and now I feel so much more free and capable of self-expression that is true to who I really am. I am not afraid to express the wide range of emotions, feelings, and can use things like clothes, accessories, art, dance and writing to fully be myself in this world. I feel as though I have created a monster in a way because I cannot get enough of doing what I feel, this is what makes me feel the love for my own life. The gift of freedom to be who I am (which I gave to myself by doing the hard work to allow this space to exist) and who I want to be in this world is something that I receive from as well as those around me. I used to think that my depression, my anger, my pain was all I had to offer the world and I lived a very isolated life because I felt exhausted pretending to be happy and shiny for others. Now I know that if I express what I am feeling in a productive way ie: dance, art, writing I am showing myself that I matter, that I care, that I love myself. When I feel loved and cared for by my self I no longer search for others to fill that void. This allows me to then bring people into my life in a way that aims to enhance my life and brings a deep sense that I can enhance their lives as well. No more hiding who I am as this leads to the world missing out on what I have to offer. Now that I see what I have to offer I feel like I am on fire with Passion and Zest for my own life. I cannot wait to share, experience, do and learn more. I now see that I can offer so much more when I am well cared for. It is not a luxury to be expressive, have material things, to dance, to do art or to live a creative life, it is my Karma and I will use all of the tools and gifts I am given in this life to their fullest in order to reach my potential and help others reach theirs.